As promised, we’re sharing out some more highlights from the PMI National Conference that took place back in April. The theme was “The Change Makers”. In this episode, you’ll hear more from attendees, speakers on the day and also some key takeaways from our MC for the day, Anton Savage. 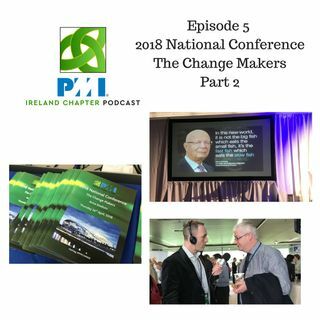 Reminder in upcoming episodes of this podcast, we’ll be sharing insights that were captured from the LIM where we were delighted to talk with one ... See More of the 5 founders of the PMI, Jim Snyder. We also interviewed the current CEO of PMI, Mark Langley, other members of the PMI board and over 20 presidents and members from chapters all over the world. All this great content will be shared in upcoming episodes of this podcast. So, I’ll hand you over to the Vox Pop part 2 from the National Conference. Enjoy! Till next time. 9.MC for the day, Anton Savage on his key takeaways from the day on Change!